Army medical team conducted free circumcision to the residents of San Jose, Northern Samar in connection with the MEDCAP activities conducted on May 5 and 6 2012. BRGY MAGSAYSAY, Lope de Vega, Northern Samar – In consonance with the AFP’s Internal Peace and Security Plan (IPSP) Bayanihan, the troops of 20th Infantry (We Lead) Battalion, 8th Infantry (Stormtroopers) Division, Philippine Army has conducted a Medical and Dental Civic Action Program (MEDCAP) in the municipality of San Jose, Northern Samar last May 5-6 this year. According to Lieutenant Colonel Noel Vestuir, Commanding Officer of 20IB, a total of 881 patients coming from the barangays of San Jose benefited from the MEDCAP. 474 availed the free medical consultation where free medicines were also given, 100 underwent the tooth extraction and dental cleaning, 257 availed the free eye check-up and 259 were circumcised. Also, a total of 300 reading glasses were distributed to the patients after a free eye check-up. The MEDCAP was spearheaded by Kaunlaran para sa Kabataang Pandaigdig (KKP) Foundation, Local Government Unit (LGU) and Line Government Agencies (LGAs) of municipality of San Jose, Northern Samar and medical and dental teams from the Philippine Army’s 8th Infantry Division, 803rd Brigade and 20IB. San Jose Mayor Damian Luzon expressed his gratitude to the group for their efforts in bringing the services to the residents of the municipality. The overwhelming success of the said activity is a glaring example of genuine cooperation, collaborative efforts and commitment of all stakeholders in bringing the services to our people that exemplifies the true spirit of Bayanihan. The Philippine Army together with the LGU of San Jose and other stakeholders, call out for other service-oriented organizations to advocate such convergence of effort to help uplift the lives of our fellow Filipino people especially those in the remote areas. MANILA – Vice President Jejomar C. Binay said he is optimistic the Philippines will retain its current status in this year’s Global Trafficking in Persons (GTIP) Report of the U.S. Department of State. Binay, the Presidential Adviser on Overseas Filipino Workers’ Concerns and Chairman Emeritus of the Inter-Agency Council Against Trafficking (IACAT), said he expected the Philippines to still be in included in the countries with Tier 2 status in the GTIP report scheduled to be released next month. “Our goal has always been to be upgraded to Tier 1 status, but even if we don’t make it this year, given the number of trafficking-related convictions we had since the latest GTIP report was released, we are confident that we will remain in the Tier 2 list,” he said. Countries in Tier 1 status are those that fully comply with the minimum requirements of the Trafficking Victims Protection Act of the United States, while those in Tier 2 do not meet the minimum requirements but are making significant efforts to do so. Binay said that there were 12 trafficking-related convictions with 18 persons convicted from April to December 2011, while there were five convictions with 12 persons convicted from January to April this year. He said that these convictions were included in the report submitted by the Philippine government to the U.S. State Department for inclusion in this year’s GTIP Report. The Vice President said since there have been 39 convictions since the start of the Aquino administration, with 48 persons convicted. “To give you an idea of just how significant the increase is, compare the 39 convictions we have accumulated in the past 22 months to the 29 convictions the previous administration had from 2005 to June 2010,” he said. The Philippines was elevated to Tier 2 status in the GTIP Report released in June last year. The country was in Tier 2 Watchlist status in 2009 and 2010. Binay credited the increase in trafficking-related convictions to the creation of the IACAT Operations Center (OpCen) and closer coordination with non-government organizations (NGOs). “The IACAT OpCen and our ties with NGOs have been vital to the increase in the number of trafficking cases filed and the number of convictions we secured,” he said. Binay said that the latest operation of the IACAT OpCen included the rescue last April 25 of four women, including three minors, offering sexual services in two KTV bars in Tondo, Manila. “We now have the owners of the Boholano and Therese/Nakamura-Sakamura KTV bars in custody and cases for violation of RA 9208 (Anti-Trafficking in Persons Act of 2003) and RA 7610 (Special Protection of Children Against Child Abuse, Exploitation and Discrimination Act) as amended are now being prepared to be filed against them,” he concluded. CEBU CITY – The Ramon Aboitiz Foundation Inc. (RAFI) Culture and Heritage Unit and its partners will hold the sixth run of Gabii sa Kabilin on May 25, 2012 from 6 p.m. to 12 midnight. This year the heritage event will feature 21 main attractions composed of museums and cultural sites in the cities of Cebu and Mandaue. These are Aboitizland Heritage Pocket, Ayala Center Cebu Cinema and The Terraces, Fo Guang Shan Chu Un Temple, Bank of the Philippine Islands (BPI) Museum, Don Sergio Osmeña Memorabilia and Art Gallery, Cathedral Museum, Casa Gorordo Museum, Cebu City Museum, Cebu Normal University (CNU), Fort San Pedro, Jose R. Gullas Halad Museum, Mandaue City Plaza, Museo Parian sa Sugbo, Museo Sugbo Complex, Plaza Independencia, Sacred Heart Parish Church and Alternative Contemporary Arts Studio (ACAS), Basilica Minore del Santo Niño through the Santo Niño de Cebu Augustinian Social Development Foundation (SNAF), University of San Carlos Museum, University of Southern Philippines Foundation (USPF) Rizaliana Museum, and Yap-Sandiego Ancestral House. Gabii sa Kabilin’s new participating sites this year are Ayala Center Cebu Cinema and The Terraces, Fo Guang Shan Chu Un Temple, BPI Museum, CAP Theater, JRG Halad Museum, and University of San Carlos Museum. The BPI Museum will be available for viewing to Gabii sa Kabilin guests from 8 a.m. t0 4 p.m. only. Tourists are treated to cultural performances, exhibits, art fairs, food markets, and interactive demonstrations in the 20 main sites. For this year's Gabii sa Kabilin, there are various suggested routes according to specific themes applicable to the museums and heritage sites, which guests can choose from. These themes include Museums; Art Galleries and Alternative Spaces; Heritage Structures; Educational; Churches, Temples, and Sacred Places; and Public Spaces. There'll also be a walking tour along heritage sites that are within walking distance from each other. With one ticket worth P150.00, local and foreign tourists may go to as many participating museums and cultural heritage sites within the six hours of the heritage event. The ticket also allows them to take as many rides as they want in Gabii sa Kabilin-designated buses and one tartanilla (horse-drawn carriage) trip in Cebu City’s old district. Tickets will be sold starting May 10 at the 22 participating museums and cultural sites, including the concierge at Ayala Center Cebu. Detailed information about the participating sites and their presentations as well as tour routes of Gabii sa Kabilin will be available for download also on May 10 at www.rafi.org.ph or www.facebook.com/rafi.org.ph. In previous Gabii sa Kabilin runs, places of historic and cultural significance within walking distance or along the tour routes are also earmarked. These have also grown in number this year. Some of them are the 1938 VECO Buiding, Asilo de la Milagrosa, Matilda Bradford Church, Cebu Provincial Capitol Building, Cebu Puericulture and Maternity House, Compania Maritima, early 1900s warehouses along M.C. Briones Street, Fuente Osmeña, Gotiaoco Building, Iglesia Filipina Independiente Cathedral, Malacañang sa Sugbo, Mother of Perpetual Help Parish Church, old Southern Islands Hospital, Plaza Hamabar, the old bridges of Sikatuna and Zulueta Streets, Oriente and Vision Theaters, Plaza Sugbo, Plaza Hamabar, University of the Philippines-Cebu College, and Yutivo Building. An added attraction to Gabii sa Kabilin 2012 is a set of children’s activities that will be held from 6 p.m. to 8 p.m. in six participating sites, namely, Ayala Center Cebu, Casa Gorordo Museum, Cathedral Museum, Cebu City Museum, Cebu Normal University, and Fort San Pedro. Implementation of Gabii sa Kabilin is made possible through partnerships with the local government units of Cebu City and Mandaue, Cebu City Traffic Operations Management (CITOM), Philippine National Police–Cebu City (PNP), Cultural and Historical Affairs Commission (CHAC) of Cebu City, Province of Cebu, Department of Tourism–Region VII and Santo Niño de Cebu Augustinian Social Development Foundation. RAFI and its partners are also assisted by tanods, officials and residents of 26 barangays in Cebu City. Major sponsorship is provided by Smart Communications. Dr. Jocelyn Gerra, executive director of RAFI-Culture and Heritage, said that the expansion of Gabii sa Kabilin in terms of participating museums and activities is a breakthrough as it means that more organizations and individuals are becoming aware of the beauty and importance of local heritage. She also said that this indicates a positive trend in efforts to promote and protect Cebuano-Filipino culture. The diversity of presentations and activities that participating museums and cultural sites are offering this year, she added, shows the cosmopolitan character of Metro Cebu. It is fitting therefore, Gerra noted, that Gabii sa Kabilin is tagged as a highlight event in the year-long celebration of the selection of Cebu City as an ASEAN City of Culture. On May 18, Gabii sa Kabilin in Argao and Sibonga will be launched in partnership with RAFI and the local government units of the two towns. Culture & Heritage is one of the focus areas of RAFI. It aims to help communities understand, value and share their culture and heritage with others. The foundation’s other focus areas are Integrated Development, Micro-finance & Entrepreneurship, Leadership & Citizenship, and Education. For more information about Gabii sa Kabilin and other programs of the RAFI-Culture and Heritage, please call 418-7234 local 703 and look for May or Florencio. CAMP RUPERTO KANGLEON, Palo, Leyte – PNP PRO 8 scored anew in the accounting of wanted persons and the service of warrants by arresting the no. 1 Most Wanted Person of Southern, Leyte. At about 6:00 PM on May 2, 2012 at Barangay Tinago, Inopacan, Leyte, joint elements of RID PRO 8 led by PSInsp Jovy Espinedo, SLPPO Deputy Intel Officer PSInsp Delfin D Tan and PSInsp Allan Oliveron Cerro, chief of police of Inopacan Police Station, MIG 8 and S2 19IB, PA led by 1Lt Lago conducted manhunt operations which resulted to the arrest of Southern Leyte’s no. 1 most wanted person (Provincial Level). Subject person was identified as Jaime Doria Soledad alias “Ka Mike/Tony/Cyril/Anton/Glenn”, 63 years old, married, jobless and temporarily residing at said place. He is dubbed as Communist Terrorist leader and an active personality of the dismantled South Leyte Front (SLF). Soledad was arrested by virtue of Warrant of Arrest issued by Honorable Judge Apolinario Buaya, Presiding Judge of RTC Branch 35, 8th Judicial Region Ormoc City for the crime of Double Murder docketed under Criminal case number 6955-0 and 6956-0 with no bail recommended. Immediately, he was brought to Inopacan Police Station for documentation and further brought by RID8 to Ormoc City Police Station Precinct 1 for proper disposition. PDG, Nicanor A Bartolome, Chief PNP believes that one criminal off the street accords citizens with a sound sleep directing all Police Regional Offices to conduct an obstinate, efficient campaign and advocacy by implementing a wide-ranging pro-active approach/strategy on the campaign against Wanted Persons in coordination with various law enforcement and other concerned government agencies. 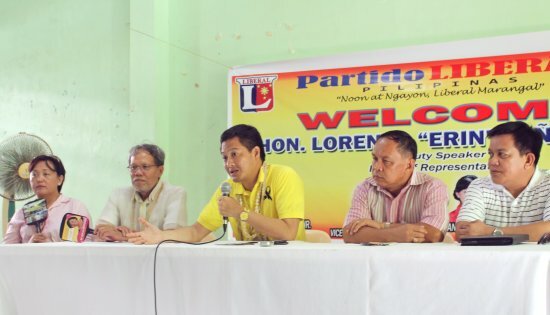 BORONGAN CITY – Eastern Samar Governor Conrado B. Nicart Jr found an ally in Quezon Province’s 4th District Representative Lorenzo “Erin” Tañada III. “Governor Nicart’s decision, I believe, was for the good of the people of Eastern Samar,” Tañada told members of the local media in a press conference on April 24. Nicart had earlier announced that he was defying the injunction order from Judge Elvie Lim that prohibited him from using funds appropriated under the 2012 annual budget. The order came about after BMs Aldwin Aclao, Atty. Byron Suyot, Jojie Montallana, Atty. Enerio Sabulao, Jenny Baldono and Betty Reyes filed a petition for prohibition early February alleging the province’s 2012 budget failed to get the required number of votes for its passage. “The budget ordinance needs a vote of 50% of the total board members plus one which translates to eight votes. They only got seven votes,” Atty. Enerio Sabulao, one of the six board member petitioners said in a separate press conference. But the court battle reached the halls of the Capitol during the last few days of March as all of LGU’s financial transactions including the payment of employees’ salaries, wages and other benefits were ordered stopped. “What we have done is for the good of Eastern Samar in general. We have to uphold the law and the law tells us that we need eight votes to pass the budget ordinance,” Sabulao told the employees in a dialogue. Sabulao told the employees further that the governor could have resorted to re-enacting the budget to make sure there would be no paralysis in the LGU’s operations. “I couldn’t even look my employees straight in the eyes because I know how not getting their pay on time affected them and their families,” Nicart said when he ordered the provincial accountant, provincial treasurer and budget officer to disburse funds on April 3. “In the same way Justice Department Leila de Lima defied the TRO from the Supreme Court, Gov. Nicart thought of the greater good when he decided to defy the injunction order,” Tañada said. QUEZON CITY – Eight of the forty three health workers, collectively known as the Morong 43, today filed a criminal case against Gloria Macapagal-Arroyo, Gen. Victor Ibrado, Gen. Delfin Bangit, Lt. Gen. Jorge Segovia, Col. Aurelio Baladad, Col. Cristobal Zaragosa and 10 other officials of the AFP and the Philippine National Police (PNP) for violations of the Anti-Torture Act of 2009, Republic Act 7438 (Rights of Persons Arrested, Detained or under Custodial Investigation), and robbery. “Pres. Noynoy Aquino said it himself, that the arrest and detention of the health workers are ‘fruits of the poisonous tree.’ It is however, lamentable that instead of immediately prosecuting those responsible for their illegal arrests and incarceration, the promotion of these military and police officers are being effected. It is déjà vu, similar to period of former Pres. Arroyo, when Maj. Gen. Jovito Palparan Jr. who, despite many cases filed against him, was heaped upon with promotions and accolades,” Palabay said. In a letter sent to the Commission on Appointments (CA), through its secretary Atty. Arturo Tiu, KARAPATAN and the Council for Health and Development (CHD) expressed their opposition to the confirmation of the promotion of three officials of the Armed Forces of the Philippines (AFP) who are direct parties to the illegal arrest, torture and detention of the 43 health workers. The said officials are Lt. Gen. Jorge Segovia, Brig. Gen. Aurelio B. Baladad and Col. Jaime Abawag. Col. Abawag has no formal appointment yet but was already in the list of Karapatan and CHD for future reference for the CA. Karapatan chairperson Marie Hilao-Enriquez expressed “alarm upon learning of the recent appointment of the above-mentioned officials, they being perpetrators of gross human rights violations.” Hilao-Enriquez was one of the signatories, along with Dr. Eleanor Jara for the CHD, of the letter submitted to the CA. Last year, on April 4, 2011, six of the 43 health workers also filed a civil case for damages under Articles 27, 32 and 33 of the Civil Code at the Quezon City Regional Trial Court. Segovia, Baladad and Abawag were among the respondents for illegal arrest, torture, arbitrary and illegal detention. A complaint was also filed before the Commission on Human Rights on February 25, 2010 against Segovia and Baladad. “Thus, their supposed promotion must not be allowed and the institutions that gave the clearances for such promotion must answer to the people,” said Hilao-Enriquez. Vice President Jejomar C. Binay leads the inauguration of the Disiplina Village Phase I, along with San Miguel Brewery, Inc. President Robert N. Huang and Valenzuela City Mayor Sherwin T. Gatchalian. The Disiplina Village Phase I will house 368 families who were displaced by typhoon Ondoy in September 2009. San Miguel Brewery is one of the partners of the local government in constructing the Phase II of the village. MANILA – Vice President and Housing and Urban Development Coordinating Council (HUDCC) Chair Jejomar C. Binay today led the turnover of keys to 96 beneficiary families displaced by Typhoon Ondoy in 2009 in Valenzuela City. Located at Brgy. Ugong, Disiplina Village Phase I is the first housing project intended specially for Valenzuela's Typhoon Ondoy victims. It was initiated by the local government of Valenzuela under Mayor Sherwin Gatchalian in partnership with the private sector and non-government organizations. “Akoy lubos na natutuwa na sa ilang panahong inyong paghihintay ay natupad na ang inyong pangarap na magkaroon ng sarili at ligtas na bahay. 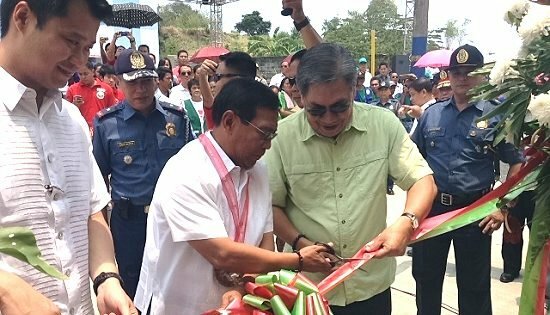 Kami po sa pamahalaan ay taos pusong tutulong sa inyong kapakanan at hangad namin ang inyong maayos, matiwasay at disiplinadong pagtira sa inyong bagong mga tahanan dito sa Disiplina Village,” Binay said. Binay cited the village's thrust of values formation, saying that the success of a community stems both from its physical structures and its moral and spiritual needs. "Matindi ang aming paniniwala na ang matagumpay na pag-buo ng isang komunidad ay hindi lamang nakasalalalay sa pisikal na istruktura kundi nakatayo rin sa moral at spirituwal na pangangailanagan ng pamayanan," the Vice President said. He added that programs such as the values formation program which Disiplina Village promotes should be implemented in all newly established communities in the country. Binay also reiterated that people should cease dubbing the government's housing programs for the poor as "resettlement" and "relocation" sites, and stressed that these should instead be called newtowns or new communities. "Sa dami ng mga pamilyang dinala natin dito upang mabigyan ng bagong pagkakataon na magpanibagong-buhay, talaga namang bagong pamayanan o komunidad ang dapat itawag natin sa mga pabahay na ito," he stated. Binay asserted, "Ibig lang po namin na maalis sa kaisipan ng mga tao, laluna sa mga benepisyaryo ng programang pabahay ng gobyerno, ang pag-aakala na sa gobyerno lamang nakasalalalay ang tagumpay ng isang proyektong pabahay at ang mga benepisyaryo ay tumatanggap lamang. Ang proyektong ito ang magpapatunay na hindi ito totoo." The project aims to help a total of 1,860 affected families living along the danger zones of Tullahan River. The site, located on an area totalling 1.9 hectares, will have medium-rise 56-cluster housing buildings and can accommodate 900 families. For Phase II implementation of Disiplina Village, eighteen (18) 3-multi-storey buildings (MSBs) will be constructed and will house 606 affected families from Tullahan River. NHA will fund and implement the construction of the said MSBs while the Valenzuela LGU will also fund and undertake the implementation of the project’s land development component. Last February 2011, 16-unit housing buildings were already turned over to 46 beneficiary families in an event dubbed, “Bagong Bahay, Bagong Buhay sa Disiplina Village”. For a minimal lease cost of P300 a month, these families benefit from free community empowerment programs conducted by the Gawad Kalinga and the city government such as kapitbahayan trainings, Bayan Anihan or vegetable gardening on idle portions of the lot and values formation programs. Disiplina Village was also noted by the World Bank as an example of a sustainable multi-partnership model which other LGUs can emulate to realize their slum upgrading programs. Binay and NHA general manager Chito Cruz awarded a citation to Valenzuela City for its efficient housing strategies and humane stance on relocation process and responsive socio-economic services to nurture the new communities. TACLOBAN CITY – Twenty-six athlete-scholars of the Leyte Sports Academy made it to the final cut that form part of the EVRAA delegation to the upcoming Palarong Pambansa 2012 to be held in Lingayen, Pangasinan on May 6-12, 2012. Former board member Rowil Batan, who heads the management of the LSA at the Leyte Sports Development Center, said the athletes garnered spots to join the delegation after they won medals during the EVRAA Meet 2012. The LSA athletes would mostly represent the region in athletics and swimming in the Palarong Pambansa. To recall, during the Maasin EVRAA Meet, the LSA-bred athletes in track and field earned a total of 34 medals out of the 49 medals; while, in swimming, out of 64 participation in various swimming heats, the LSA tanks garnered a total of 47 medals out of the 56 medals contended. Leyte Governor Carlos Jericho Petilla meanwhile urged the LSA athlete-scholars to show their best and get good standing. He likewise urged the rest of the competing delegation from Eastern Visayas to earn a better medal finish this year. The governor likewise said, the Palarong Pambansa is a good “exposure” for local athletes to test their skills and discipline. “I would like them to regularly compete so their skills can be tested. They cannot just grow on their own. They have to regularly get exposed and compete with others,” Gov. Petilla said. Among the sports included in this year's Palarong Pambansa are athletics, arnis, badminton, baseball, basketball, boxing, chess, football, gymnastics, sepak takraw, softball, swimming, table tennis, taekwondo, tennis, and volleyball. Most these sporting events will be held at the Narciso Ramos Sports Center in Lingayen, though there will be activities held in the cities of San Carlos, Bugallon, Binmaley, and Dagupan City. Over 10,000 student-athletes, coaches and sports officials from all over the country are expected to participate.